When Crete fell to an airborne invasion in May 1941, Stockbridge, then a signals sergeant in the Field Security Corps, was evacuated to Egypt with the remnants of the Allied forces on the island. He promptly asked to return, and was put in touch with the Inter Services Liaison Department (a cover name at GHQ for MI6). Stockbridge and Captain Jack Smith-Hughes, an SOE officer, were infiltrated into Crete in October 1941 aboard the submarine Thunderbolt. They later learned that this vessel was originally Thetis, which had sunk on its trials in Liverpool Bay in 1939 with the loss of many lives. The boat sank for the second and final time, with the loss of all hands, in 1943. 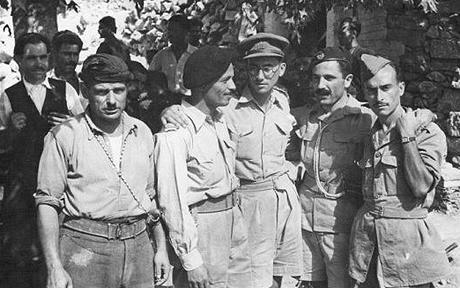 They were the first British mission to return to Crete, and were charged with developing its resistance movement. Stockbridge had never discovered what the duties of Field Security were, but he had become fluent in Cretan Greek while stationed there, and had made many contacts in the Heraklion area. This knowledge was now put to good use. Despite being constantly on the run, he managed to keep transmitting valuable information to Cairo. Sometimes he operated from a cave high in the mountains. Drinking water was collected from stalactites. Meals in “safe houses” consisting of seed potatoes washed down with mugs of orange peel tea were recalled with nostalgia when their food later ran out and he and his comrades had to subsist on grass soup, wild herbs and snails. When Stockbridge organised a parachute drop, little fell within the dropping zone. Sacks of flour could be seen bursting on distant rocks, while other supplies slid down steep precipices and could not be retrieved. Clean-shaven, wearing shoes rather than boots, an overcoat and horn-rimmed spectacles, his appearance and stumbling gait matched his “cover” story: that he was a village schoolmaster. He used the name Michalaki, and later, Siphi. Sometimes he had to go into towns and pass checkpoints manned by German security police. “They must have been blind not to see me trembling,” he said afterwards. On one occasion, he and a comrade were being pursued by a large patrol of Germans and Italians. Forced to hide their equipment and make a stand, they killed six of their pursuers. On another, he was going through a checkpoint with Levtheri Kalitsounakis, who acted as his assistant. Stockbridge passed the inspection, but Kalitsounakis – who had reddish hair and green eyes – was suspected of not looking like a Cretan and was stopped and closely questioned. Stockbridge was so distracted that he bumped into a German soldier. “Gosh! Sorry!” he said in English. Then, realising what he had done, he had to fight the temptation to take to his heels, and instead stroll casually away. In April 1942, three months after being commissioned, he found himself in even greater danger, after being betrayed. Evacuated to Egypt in May and awarded an MC, he volunteered to go back again. In early 1943 he and his wireless operator, John Stanley, were re-infiltrated aboard a Greek submarine. They rowed ashore in a rubber dinghy and landed on the north coast of the island. As they came in, they gave the password to some Cretans who arrived in a small boat. These men, who had been fishing illegally, feared that they had been discovered by the Germans; they panicked and disappeared. On going ashore, Stockbridge and his companion found themselves in a minefield. They extricated themselves and moved further down the coast, where their first contact was Paddy Leigh Fermor. While Stockbridge, the senior MI6 officer on the island, based himself at Rethymno and gathered intelligence in the central and eastern parts of the island, Leigh Fermor concentrated on his work for SOE. After the German surrender, Stockbridge’s service of three years in Crete, two and a half of them during enemy occupation, was recognised by a Bar to his MC. He was also made an honorary citizen of Rethymno. Ralph Hedley Stockbridge was born at Bournemouth on April 18 1917 and educated at the Perse School, Cambridge. It had been decided that he should have a classical education, a decision with which he complied without enthusiasm. He set a precedent by resigning from the Officers Training Corps because he disliked the excessively militaristic member of the staff who ran it and he considered the wearing of puttees a tiresome relic of the Boer War. On the sports field, he captained the 1st XV and the athletics team and, in the one year he boxed, he won the Under Nine Stone title. In 1935 he broke his leg playing rugby. The enforced absence from school and the encouragement of the senior classics master resulted in Ralph taking the Cambridge examination on crutches and winning a scholarship to Peterhouse. He spent the next three years in pleasant indolence and took an upper second. After the war he joined MI6 – where he was known as Mike – on a permanent basis. As vice-consul in the Salonika consulate-general from 1946 to 1950 he reported on the intelligence aspects of the Greek civil war. He was vice-consul in Alexandria from 1952 to 1954, and over the next few years spent time in Beirut, Tehran, Baghdad and Syria. He was at the British embassy in Athens from 1959 to 1966. In 1961 Henry Leach (later Admiral of the Fleet Sir Henry Leach) paid an official visit to Heraklion. The British ambassador asked Stockbridge, then the First Secretary, to accompany him. At the reception on board, many of the guests were Stockbridge’s former wartime comrades. Leach wrote in his memoirs: “They were marvellous people with walnut-like faces from constant exposure to the elements. Few wore collars or ties. Such was their personality that their complete inability to speak a word of English seemed not to detract at all from the conviviality of the occasion. Stockbridge returned to England in 1966 and served with MI6 in London until 1972. On his retirement he spent six happy years as bursar of St Faith’s preparatory school in Cambridge. Settled in a village in Cambridgeshire, he had more time to enjoy his books, his large stamp collection and corresponding with his many friends, most of them Greek or French. Ralph Stockbridge died on March 10. He married first (dissolved), in 1948, Margaret Elizabeth Garrett. He married secondly, in 1963, Katharine Price. They survive him with a son and a daughter from his first marriage and two daughters from his second.